Every second year, the first week of January is a time of change in US politics. Some senators and members of the House of Representatives leave national, legislative politics, either voluntarily, because they retire, or involuntarily, because they are defeated, and a new crop of legislators is sworn into office. Last week saw more change than normal. Many Republican members of the House decided to retire in this electoral cycle and a number of others were defeated. Enough new Democrats were sworn in to let their party take control of the House. Every fourth year, the time of change is also overlaid with a time for unveiling ambition. The two-year campaign for the US presidency begins as candidates in the “out” party register their exploratory committees and begin to make public their cases for support. Candidates from the “in” party ordinarily wait a bit longer to unveil their ambitions. This year, the first week of January saw the intersection of both the time of change and the time of unveiled ambition. Alexandria Ocasio-Cortez, “AOC” in the shorthand of Twitter, took her oath of office as a new member of the House representing part of the Greater New York area, released a new dance video, and began talking up the platform that would serve her future presidential campaign (she won’t reach the minimum age for running for the presidency until mid-2020s). That platform, the “Green New Deal”, is an ambitious mash up of policies. It would accelerate the US “transition” away from fossil fuels. It would extend “free” medical care to all Americans. And it would deal a blow to after-tax income inequality by hiking the top marginal tax rate. 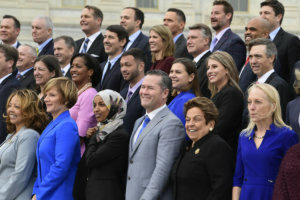 AOC’s Green New Deal helps the leadership class of her party by giving Democrat activists something to talk about other than impeaching President Trump (at least until the Mueller investigation reports, at which point, regardless of Mueller’s findings, impeachment will be the price of peace in Democrat ranks). It helps various donor communities in her party by promoting fuel-substitution policies and government spending programs that are both rich with opportunities for rent-seeking. And, oddly, it serves the interests of conservative think tanks and editorialists who see the Green New Deal as a fantastic reason to produce voluminous papers, studies and columns pleasing to their financial backers. A win-win for American politics. The riskiest part of AOC’s Green New Deal is its proposal to hike taxes on the rich. At the moment, she proposes to hike the marginal tax rate for a small slice of the voting US public at 70-80%. Given how few people will actually pay that rate, why is her proposal risky? Because savvy middle-class voters know that, as the cost of the Green New Deal grows, soon they will be paying that 70% rate as well. But it is in the interests of AOC and her allies to pretend that only a handful will pay that rate on their marginal earnings. So the question, for the moment, is whether a 70%+ tax rate is a good idea even if it only applies to a few people. In early January, economist Paul Krugman devoted his New York Times column to a short de fence of AOC’s 70% tax rate. He writes that Rep. Ocasio-Cortez has been consulting some “very good” economists, and one suspects this includes Krugman himself. And what advice does a “very good” economist have for AOC’s tax policy? Krugman begins with assertion that the rich respond to the same incentives as anyone else. Since a marginal dollar of income for a rich person is less valuable than the same marginal dollar of income for the poor, he concludes that the rich don’t really care about their marginal tax rate. Since they don’t, the only thing that matters when taxing the rich is to set a rate that maximizes the government’s tax revenues. Besides which, Krugman speculates, rich people probably earn some of their income by exploiting monopolies and that income serves no purpose at all. Economic research, Krugman assures us, shows that the tax rate that maximizes government revenue is somewhere north of 70% and so he declares AOC’s tax policy is sound in economic terms. Having grounded his claim on the findings of economics research, Krugman is bound to spark a tedious reaction from other economists who have other studies that support other conclusions. Despite its theoretical and methodological sophistication, the economics discipline likes a good argument as much as any other group of scholars. Every conservative think tank in the US will contribute to this tedious reaction because defending lower tax rates against a high-profile progressive like Krugman lets them raise money from rich donors. Americans will soon hear how much high marginal tax rates hurt investment and hurt job creation and hurt international competitiveness and hurt gross tax revenues and so on and so on. Laffer Curves will be re-printed en masse. Along the way, someone will point out that the graph Krugman uses to bolster his point actually shows that cuts in the top marginal tax rate seem to coincide with periods of higher economic growth. And so it’s fitting that last week also saw the release of Bill Kristol’s conversation with Harvey Mansfield about Aristotle and democracy. Kristol has published conversations with his friend and teacher on more than a dozen subjects ranging from the US founding to its political parties and the politics of Donald Trump. Mansfield’s reflections on Aristotle are occasioned by the publication of Delba Winthrop, his late wife’s, book Aristotle: Democracy in Political Science. The conversation between Kristol and Mansfield was recorded nearly two years ago, when hardly anyone had heard of Alexandria Ocasio-Cortez. But Mansfield has devoted his career to studying the eternal questions of politics and the appropriate approach to the rich is one of those eternal questions. Krugman, beset perhaps by the limits of his discipline and his progressive orientation, writes as if no one has considered what to do about the rich before 2019. Can we learn anything about how to treat the rich by delving deeper into the human experience? Mansfield and Winthrop begin their reflections on Aristotle with Book Three of Politics. In the middle of Book Three, Aristotle suddenly cries out “by Zeus!” and then does so again a page or so later. These are, Mansfield notes, the only two times that Aristotle loses his cool in print and swears out to the gods. The first “by Zeus” comes as Aristotle is “deplores the fact that in the most extreme democracy, the majority will decide on its own to despoil the rich.” And while a 70-80% marginal tax rate may not quite amount to despoiling the rich, it comes awfully close. Despoiling the rich seems “unjust” to Aristotle so a 70-80% despoliation must seem 70-80% unjust. Aristotle’s democrat cannot defend his decision to expropriate another man’s wealth, so he has to call in the god “to help him out,” Mansfield explains. Democracy “can’t really defend or explain itself in the terms that it would like according to which all are equal and the equal majority can do what it wishes.” So democracy must call on Zeus. Today, Democrats have no need of Zeus or any other god because they have recourse to economics to justify the 70% despoliation of the rich. Or do they? Economics does not justify the arbitrary expropriation of wealth, even for purposes as noble as accelerating fuel transitions and providing everyone with “free” medical care. Economics can estimate what marginal tax rate will maximize government revenues, and this is helpful to those who wish to maximize those revenues and then dream up noble purposes to absorb those revenues. Further insight comes from Aristotle’s second appeal to Zeus, when the god states that “An association of human beings is different from a herd of animals.” A herd of animals is composed of many equal beasts that are nearly indistinguishable from each other. Humans are not indistinguishable. On the contrary, each human is unique. And, Mansfield reminds us, there is a hierarchy. “Some [of the] bodies are more impressive, more capable, more different” than the others. In this way, according to Mansfield and Winthrop, the second Zeus answers the first Zeus. The first Zeus says that “all of us are equal” so “most of us can decide on our own without any other higher authority” to despoil the rich. This, they say, is the democratic view, that the stronger, or the more numerous, should rule. The second Zeus responds that “the democrat needs to have some understanding or recognition of the differences in rank and hierarchy” or of aristocracy. Now, no one would claim that great wealth is, per se, an indication of being more impressive or more capable than one’s fellow citizen except in relation to the virtues of accumulating wealth. In a genuinely competitive market, economics sees the rewards of great wealth as having been justly, or at least fairly, acquired. In a market filled with opportunities for monopolies or rent seeking, the political scientist might see someone’s great wealth providing an incentive for someone else to break the monopoly or end the rent seeking. To put it another way, eventually some populist will get elected on the promise to “drain the swamp.” And so even the accumulation of unjustly or unfairly acquired wealth has a social benefit if only to indicate where one might look in search of injustices or unfairness. Taxing that kind of acquired wealth to fund bigger government programs is unlikely to reduce opportunities for monopoly or rent seeking. Populists are undemocratic in Aristotle’s terms because that their understanding of “the people” is partial rather than complete. “The democrat,” Mansfield reminds us, “stands for the people, and the people are a whole by including everybody.” Populists also stand for “the people” but by “the people” they only mean a portion of the whole – the portion that is uncorrupted and genuinely “the people.” Just as communists, when speaking of “the people,” speak not of the whole but rather of the whole excluding “class enemies,” populists are prone to describing, for example, the purveyors of “fake news” as enemies of “the people.” In the same way, Krugman’s political sleight of hand is to devalue the rich – one might say “dehumanize the rich” – as being of worth only because of the government revenues that might be generated by setting the top marginal tax rate at the optimal level. In the Mansfield/Winthrop reading of Aristotle, “the real whole is a mixture of democracy and oligarchy [aristocracy]” and each element is insufficient on its own. Despoiling the rich is not only unjust but foolhardy, and despoiling 70-80% of the rich is at least 70-80% unjust and probably 100% foolhardy. In explaining and justifying OAC’s program, Krugman devotes little attention to the ways one might accelerate the substitution of fuels or the expansion of government health services. A newspaper columnist has only a certain space on loan from the newspaper publisher and has to devote that space to the essential questions. And for Krugman, the essential questions are about how far a government can go in despoiling the rich before extinguishing their wealth. He has learned the lesson of those who killed the golden goose. By contorting his democratic instincts to the program of squeezing the rich, he neglects any consideration of the democratic equality of his fellow citizens who are rich. Krugman is an old white man, and thus might be blind even to the intersectional claims of rich persons of colour or rich people with various non-binary gender identities or even of rich women. AOC and her followers are likely to demand at least some consideration of the justice of despoiling POCs, the non-binary gendered and so forth even if they are rich. If Rep. Ocasio-Cortez is consulting Krugman, she should be careful about his insensitivity to intersectionality. In this way, the philosopher and the economist learn from politics. KRISTOL: . . . [P]hysicist and mathematicians, in my experience, more than anyone else, are acutely aware of the distinctions among themselves. KRISTOL: The really great mathematician as opposed to just extremely good mathematician and so forth. They’re very aware of this rank. MANSFIELD: Yeah, they’re like chess players. They’re very competitive. One telltale sign of the difference between an extremely good mathematician or physicist and a really great one is the awarding of prestigious prizes. Truly great physicists, chemists and medical researchers are awarded a Nobel Prize. Mathematics does not have a Nobel Prize, so that discipline has its own hierarchy of prestigious prizes to recognize its truly great accomplishments. In the social sciences, the most competitive discipline is economics. It has a Nobel of its own, although the Nobel Memorial Prize in Economics is not quite the same as the Nobel Prizes in Physics, Chemistry and Medicine. Prof. Krugman won the Nobel Memorial Prize in 2008, although “for his analysis of trade patterns and location of economic activity” rather than for an analysis of tax policy and justice. As a man of learned distinction, he might reflect on how the democratic and the aristocratic, as much as they oppose one another, find validation and success in the other. Ian Brodie is an Associate Professor of Political Science at the University of Calgary. He was chief of staff to Canada’s former prime minister, Stephen Harper (2005-08) and is author of "At the Centre of Government: The Prime Minister and the Limits of Political Power (McGill-Queen's, 2018).